After the recent (and ace) FAWPL Charity Trophy between Spurs and the Ex-England Allstars, myself and my partner in crime Kieran Theivam from @WoSoZone put on one of our ‘She Kicks Back’ events. 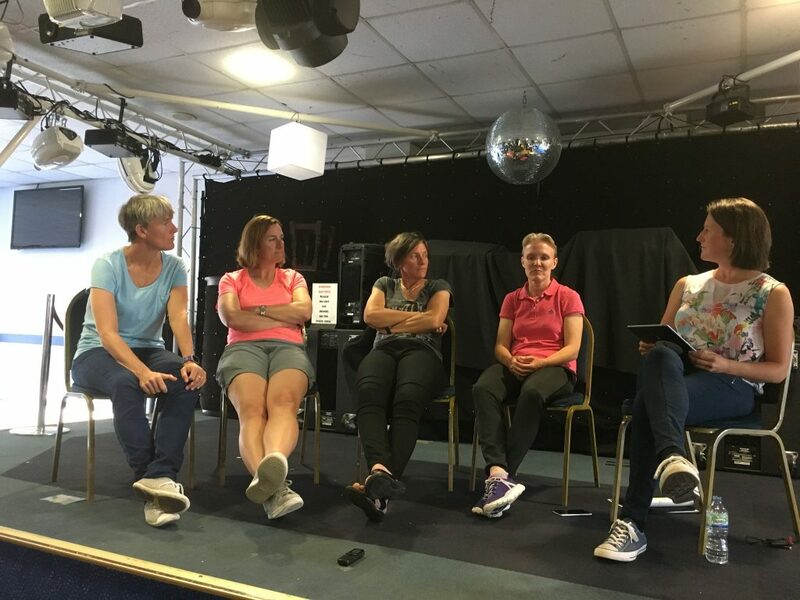 It was even more laid back and informal than our usual efforts (if that’s possible) but it was no less engaging and entertaining and it’s always an honour to speak to and more importantly listen to the thoughts, experiences and insight of some of the women’s game’s greats. On this occasion we briefly chatted to the Spurs boss Karen Hills and skipper Jenna Schillachi, then we quizzed and enjoyed some fascinating and funny exchanges between officials Lucy Oliver and her Premier Leaugue referee husband Michael, followed by candid and honest chat from GK Union members Pauline Cope-Boanas (who got Player of the Match for her 25 min master class!) and Rachel Brown-Finnis. The two keepers had the room laughing and applauding in equal measure, especially when Copey said that if some of the talents on the team that day had had any of the support and coaching that the present day players have then they’d have been truly world class. (Copey had her first GK specific coaching session in her 30s.) She also implored The FA to perhaps show greater acknowledgement of England’s former players (in the way the ECB does, said Clare Taylor about her cricket career), who had given so much time and passion to their national team over the years. Last up and with our recording devices at the ready (for a slightly more intimate audience), we invited up four incredible talents: (r to l, above) Sian Williams (Arsenal/England & Wales! 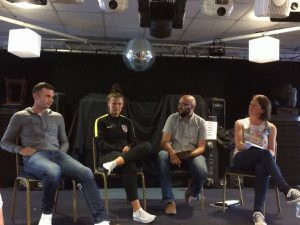 ); Clare Taylor (Liverpool & England at football & cricket); Marieanne Spacey (Arsenal & Fulham/England); and Karen Walker (Doncaster Belles & Leeds/England) to talk a little bit about some of their on-field and off-field exploits and other views on the game. It was fantastic. Another superb evening only dampened a little because of latch of a PA system. The discussions and content improve at each event you hold. Look forward with anticipation to the next one.